The first year the ads ran, Captial One total US accounts went from 29MM to over 40MM and card consideration among consumers tripled! This was the first time ever Capital One executed a sustained advertising campaign and they knocked it out of the park. We’re at a point now where you can safely leave your credit cards at home and pay for almost everything with your mobile device in store. If you own a smartphone and have the right apps downloaded, you no longer need to carry around most of the things in your wallet. Another reason you should consider emptying your wallet is for your health. Up to 85% of Americans suffer from back pain at some point in their life. For many men, a common cause is sitting on your wallet. If you’re ready to thin out your wallet, here’s what can go first. There are several stores and restaurants that accept mobile payments instead of cash or credit cards. All you have to do is download the mobile app and link one or more of your credit card accounts. You pay by tapping, this transmits a payment code via near-field communication (NFC) technology to the retail terminal. When was the last time you wrote a check? There are easier and less cumbersome ways of transferring money to people now. Most mobile banking apps allow you to send money from your bank account to anyone simply by using their email address or username. Unless you actually like cutting coupons, there’s an easier way to take advantage of all the savings. Couponing apps and other cash back apps can replace all your paper coupons, freeing up a lot of wallet space. Almost every store you go to now has its own customer loyalty card with perks and discounts. Carrying all these cards is not only annoying and bulky but unnecessary. Since most stores can look up your store loyalty account using your phone number, you really don’t need to carry the card around in your wallet. 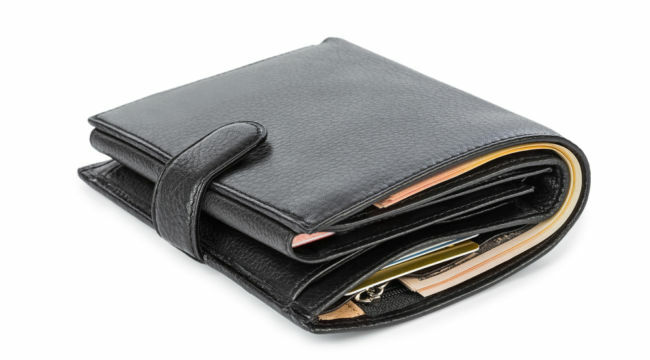 Another culprit of wallet bulk is business cards and small pieces of paper with important information written down — addresses, phone numbers, travel rewards program account numbers, etc. You don’t need to carry stuff like this around and risk losing it or having it stolen. Car insurance, health, dental, and vision policy cards can all be stored on your smartphone. The best way to capture these cards is to take photos of each one, front and back. You can organize these cards in a folder on your phone for easy lookup. And if you’re worried you won’t be able to read the numbers on the cards, don’t forget you can zoom in on the photos easily. Speaking of pictures, wallet-sized photos of your family are great but you’re limited to how many can fit comfortably in your wallet. New phones have enough storage now to keep thousands of photos on hand. Don’t settle for only a few photos when you can store whole albums in your pocket. If you travel a lot for business, you might find yourself storing paper receipts in your wallet to keep track of all your expenses. Not only is this annoying to have to store a bunch of receipts in your wallet, the paper and ink typically rubs off making reading the receipts near impossible. These are just a few things you can store on your smartphone to free up space in your wallet, saving you the hassle and back pain.